At 5 a.m. on Sunday 17th February I woke up to the indescribable and unmistakeable feeling of my water’s breaking. At 30 weeks and 6 days pregnant needless to say this was something we were not expecting, and we feared the worst as we made our way to Colchester Hospital. Two days later I was told I should make it to 34 weeks and was sent home, with a course of antibiotics and instructions to take my temperature every 4 hours and monitor the baby’s movements because I was at risk of an infection setting in. On Monday 4th March, two weeks later at 33 weeks pregnant, I began to feel sick and started experiencing pains, which I assumed, were due to being in the early stages of labour. Unfortunately this was not the case and an infection had set in. As I was prepped for a Caesarean Section we were told not to expect the baby to cry or even be breathing when he was born, and that we most likely would not get to see him, as he would be taken straight to the neo-natal unit for treatment. When Freddie was born at 1:15pm on the 4th March, weighing 4lb 7oz, he surprised us all by letting out a tiny cry. He was breathing on his own and after a quick look-over by the specialist team a nurse brought him over for us so that we could meet him before he was taken to the Neo-natal unit. It was so much more than we could have expected and we felt such a sense of relief as we thought everything would be O.K. When I asked the nurse “It looks really good doesn’t it?” her response of “Yes, but its very early days” could not have been more apt. Soon after he had gone to the unit, Richard came up to my bed with the news that he had been put onto a CPAP, a device to ease the struggle of breathing for Freddie. I was allowed to hold him for ten minutes; he was so tiny and covered in wires and bruises that as I held him I couldn’t find a single inch of him that I could kiss. That first night I spent most of the night sitting next to Freddie’s incubator. In the early hours of the morning when I did finally fall asleep, I woke up to find Freddie’s doctor and a nurse standing at the end of my bed with the news that Freddie had been put onto a ventilator as he was finding it very difficult to breathe. I waited for Richard to arrive before we went down to see him. The feelings of joy we had experienced the day before were quickly replaced with dread; we could tell by the rush of nurses around him that things weren’t right. A nurse gave us the news that Freddie wasn’t very well, they were not sure exactly what was wrong with him but they could tell he was in pain as he flinched at their touch and kept his tiny fists clenched. As the day progressed the doctors and nurses discovered more and more things wrong with Freddie; he clearly had an infection and was very pale, he was covered in bruises as his blood was not clotting properly, he could not urinate or empty his bowels, his stomach was swollen and hard to the touch, his sodium and potassium levels were not right and neither were his blood sugar levels. We were told to be prepared to be transferred to a more specialist unit at any time. On Tuesday night I sat at his bedside and watched the doctors and nurses battle to keep him alive, trying to work out what to treat first on the long list of problems. 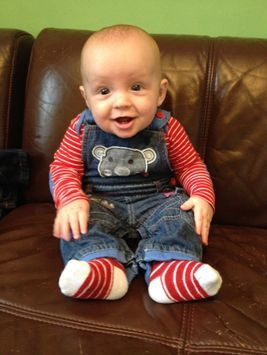 On Wednesday morning we were given a diagnosis; Freddie had Septicaemia (a potentially fatal blood infection) and acute renal failure, and was being transferred to the Royal London hospital for more specialist treatment and possible dialysis. We said goodbye to him as he was strapped into a travel incubator and made our way Whitechappel. The treatment that Freddie received when he first arrived and until he left was phenomenal. A full assessment was done and within an hour of him arriving he had had a catheter fitted so that he could urinate, relieving a lot of his pain. A new cannula was fitted as the others had all tissued, and he was started on a course of a more effective mix of antibiotics. Later a long-line was fitted in his leg as a more reliable way of getting drugs in and blood tests out without having to do heel prick tests every hour. A nurse showed us around the unit, which included a family room, a parents room with a small kitchen, sofas and a television where we could wait while the doctors completed their rounds, and the purpose built room for mum’s to express milk. The following day the staff had organised for us to stay at the house run by The Sick Children’s Trust across the road, which became our home for the next eight days. 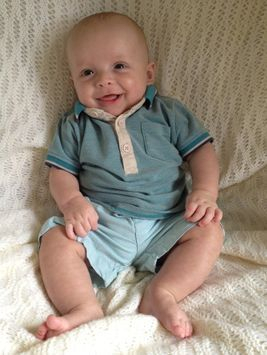 Freddie very quickly began to improve thanks to the expertise and care of the staff on the neo-natal unit. The antibiotics began working very quickly which saw his infection count come right down. When the time was right the nurses slowly took him off of his morphine pain relief and he began to wake up. We were able to talk to him and let him know we were there. As he became more awake and more frustrated with his ventilator tube he started to pull on it. Richard and I had to sit either side of his incubator holding his hands to stop him from pulling it right out. One night when I rang the unit to see how he was doing I was told that the doctors and nurses had finally given in and removed it for him, he only needed CPAP for ten minutes before he was able to breathe on his own. The next day we were able to see what he properly looked like without any tubes or wires and better still, at 5 days old we were both allowed to give him a proper cuddle. Over the next few days he was given kidney scans and was checked for a mechanical problem with his urinating however as the infection abated his kidneys improved and as the catheter was removed he began going to the toilet by himself. The nurses also slowly began giving him the milk that I had expressed through his nose tube, and I was given advice and support to start teaching Freddie how to breastfeed. On Friday 14th March we were given a call early in the morning to say that an ambulance team had arrived to transfer Freddie back to Colchester Hospital. He had arrived fighting for his life with an extremely bad infection and kidney failure, and was leaving just nine days later almost completely recovered. At Colchester hospital it was just a case of waiting for him to gain weight, as he had lost a great deal since being born, and establish his feeding before he could be sent home. We were able to bring him home on Wednesday 20th March weighing just under 4lb. Our family and friends could not believe how tiny he was, and he was certainly the smallest baby that any of them had ever held. Despite his size, he was healthy and thriving and after a kidney scan and some developmental checks was signed off from the hospital last month. He is eight months old now and has completely caught up with his weight and size. We count our blessings every day that he was given the fighting start he needed by the staff on both the Colchester and Royal London Neo-Natal Intensive Care Units and could not give them enough thanks or praise.